DIE Veneris, 23 die Novembris. Heads for a Conference about Committees of both Houses examining Public Accompts. Bill against the Importation of Irish Cattle. Message to H. C. with the Bill. "To declare, That this Conference is desired, to continue that good Correspondence between the Houses that hath been since the Beginning of this Session. 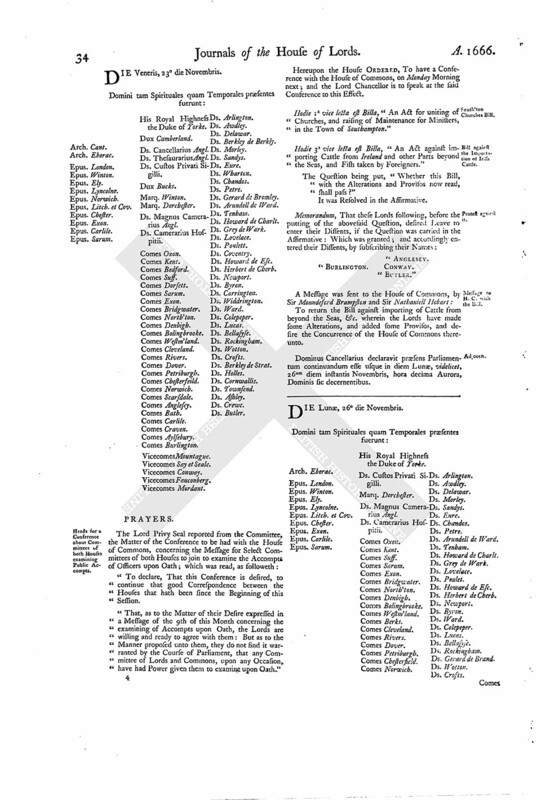 "That, as to the Matter of their Desire expressed in a Message of the 9th of this Month concerning the examining of Accompts upon Oath, the Lords are willing and ready to agree with them: But as to the Manner proposed unto them, they do not find it warranted by the Course of Parliament, that any Committee of Lords and Commons, upon any Occasion, have had Power given them to examine upon Oath." Hereupon the House ORDERED, To have a Conference with the House of Commons, on Monday Morning next; and the Lord Chancellor is to speak at the said Conference to this Effect. Hodie 1a vice lecta est Billa, "An Act for uniting of Churches, and raising of Maintenance for Ministers, in the Town of Southampton." Hodie 3a vice lecta est Billa, "An Act against importing Cattle from Ireland and other Parts beyond the Seas, and Fish taken by Foreigners." The Question being put, "Whether this Bill, with the Alterations and Provisos now read, shall pass?" To return the Bill against importing of Cattle from beyond the Seas, &c. wherein the Lords have made some Alterations, and added some Provisos, and desire the Concurrence of the House of Commons thereunto. Dominus Cancellarius declaravit præsens Parliamentum continuandum esse usque in diem Lunæ, videlicet, 26um diem instantis Novembris, hora decima Aurora, Dominis sic decernentibus.